As I sit outside with my sons enjoying the beauty of the surrounding valley I am reminded of a story that my father had told me that his father had told him and has been passed down from generation to generation. Now it is my turn to share this with my sons and so I began to tell them of the legend of La Madonna della Corona. It was a warm evening as villagers were enjoying the beauty of the Adige Valley when a blinding light could be seen emanating from the rocky wall of the Corona (the name given to the mountain ranges that look like a crown). Mesmerized by the light the villagers made the trek up the mountain and looked over the cliff to see what was causing this phenomenon. As they peered over they couldn't see where the light was coming from but they could hear what sounded like sweet melodies. The cliff was impassable but the villagers needed to try something. They decided to get some ropes and tie them to a basket and the most brave and daring would be lowered down the treacherous rocky cliff. The time had come and they lowered the basket down to the ledge. Surrounded by light was a statue of the Madonna holding the lifeless body of Jesus on her knees (the Pieta). They immediately feel to their knees in awe. The statue was to beautiful too remain there so they decided to take it with them and place it in a chapel so everyone could come and worship it. Word spread quickly and the next morning a procession of devoted people walked to the chapel, but once they arrived the statue was nowhere to be found. They searched everywhere for the statue but to no avail. Then one brave soul decided to go back down the rocky cliff and to his amazement the Pieta was there in the same spot they found it the day before. They returned the statue to the chapel, but once again the next day it was no longer there. It had returned to the rocky cliffs once again. 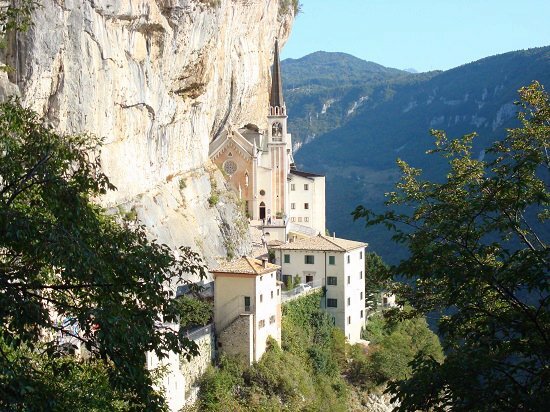 It must have been a sign and the Madonna has chosen this place for a reason and the devoted honored her wishes by building a shrine from bricks and this is how the Madonna della Corona was born. The news spread all over and soon pilgrimages were made to the shrine. One pilgrimage included Knights of St. Giovanni Gerosolimitan. The Knights were in shock when they saw the statue for it was in fact the same beautiful statue that disappeared from the island of Rhodes in 1522. The ancient belief is that angels carried the statue to the rocky cliffs of Mount Baldo where it remains to this day. This my sons is the legend of La Madonna della Corona. One day you too will be able to share this story with your children. Photo copyright © Santuario Basilica Madonna della Corona.